So it seems like this Season x.5 thing is becoming important to Cryptic. They've done half seasons in the past but not as often as they are doing it now. I guess since they have a bigger team they can do more. Anyway, I like it and just thought I'd mention it. What I really want to talk about is the revamp to the crafting system which is long overdue. It seems like Cryptic is doing whatever they can to help our banks and inventories. There will be new anomalies which will take up less space and we'll have a special place in our inventory just for them. Combined this means players who save anomalies will have a lot more empty space. I went into the Tribble test server to test it out and here's what I saw. 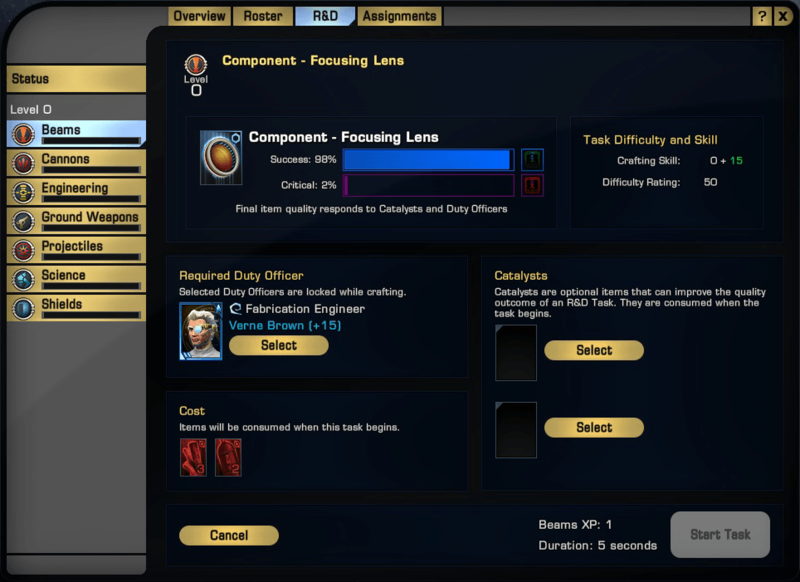 It's tied in to the Duty Officer system which is pretty cool. 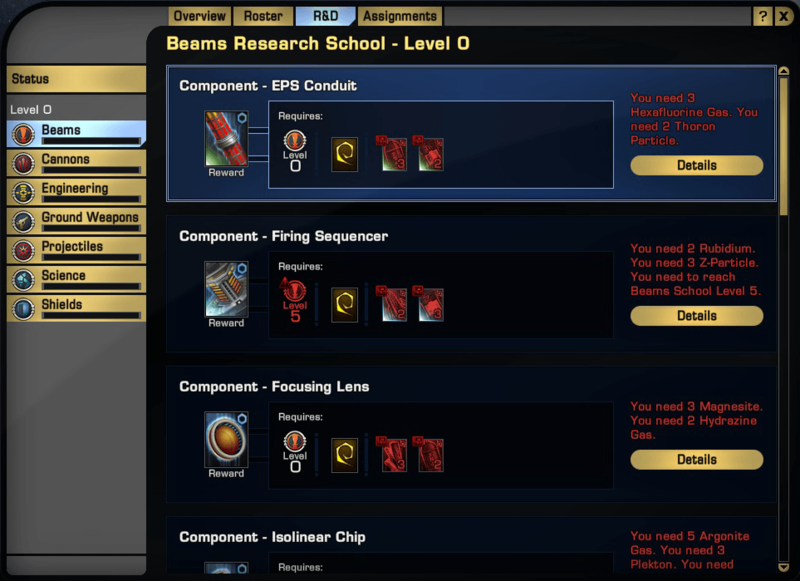 You have 5 R&D assignment slots, four of which you unlock as you increase in rank within different R&D schools. What's a school? Basically different types of equipment: Beams, Cannons, Engineering, Ground Weapons, Projectiles, Science, and Shields. So as you increase in level in these schools, you'll unlock more crafting slots. Each piece of equipment has different requirements for crafting and can even have catalyst items which improve the quality for that equipment. Overall it seems really great for something that still isn't in its final stages. It's really a great improvement. Here are a couple screen shots. Enjoy! In the comments, let me know your thoughts on this new system and what you hope to see come from it. Thanks for sharing the shots, as it looks pretty interesting. Does it seem like those characters who have already maxed crafting will get any kind of boost / leg up in the new system? Whoops! I don't know where that "not" came from. It IS tied into the doffs. To answer your question, I haven't seen any indication that we'll get some kind of boost/ leg up, however it isn't complete yet. Judging from past experience, they never let our hard work go to waste. My assumption is that those of us who maxed out will get something. I wouldn't be surprised if Dil is still involved for some items. I don't know if that nerf rumor is true or not. Personally I don't think that's going to happen, but that's just my opinion. Is there any indication, that the new Crafting system has unique items, so that it is actual worth to craft again? As far as I remember, the only thing worth to craft were the Aegis Space Set. I think one of the dev blogs mentioned that there would be more unique items in crafting so it would actually be worth doing. I listened to podcast last night and the one thing that I like about the new crafting system is you can craft unique items which can only be done in crafting. Also there is scope for further development down the track. Thank you for the brief description! I've been looking forward to a revamp of the crafting system and think it will be a boon for players. Although I *hate* crafting in any MMO I do see it's worthwhile use and do invest time into them for the sake of knowledge and the eventual item I want to be 'unique'.